Edmond Rostand's Cyrano de Bergerac is kind of the world’s most beloved romances. A poetic man with a nose like no other falls for a young woman who happens to be falling for a soldier. With conflicts all around, the characters attempt to follow their hearts while accepting the reality of their personal situations. 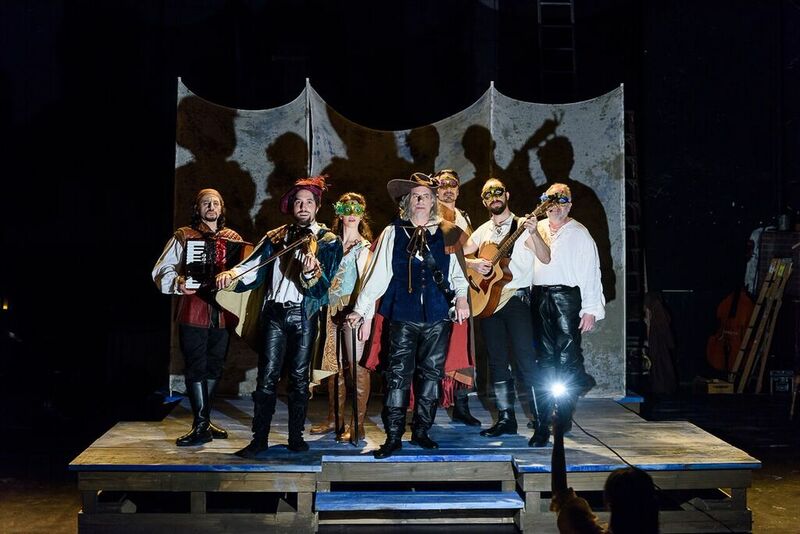 Reimagined in a striking production by Resonance Ensemble, this version of Cyrano reminds us why we love love. With only eight actors portraying an array of characters, Rostand's Cyrano is a theatrical wonder. With an adaptation from Gabriel Barre, Rick Sordelet, and Alexander Sovronsky based on the translation by Anthony Burgess, the themes of love and beauty are explored through Rostand's saga. The conceit appears to be a group of multitalented players take a stage to share the story of Cyrano, Roxanne, and Christian. And along with way, we are granted a strong sense of theatricality. Exquisitely directed by Gabriel Barre, this Cyrano will make you smile from start to finish, and maybe even make you shed a tear or two. Barre is triumphant in the fluidity of his staging. Everything and everyone moves as a singular unit. While the first act could use a major streamlining, the momentum is consistent and moving. With a less realistic vantage on the production, the weightiness of the situational backdrop is minimized, allowing the humor and love to thrive in this new imagining. The addition of live music adds such excitement to the already lovely story. The music, composed by Sovronsky, is the poetry that fills the space. It evoked the appropriate moods at the appropriate times, never overshadowing the action. The interesting thing about this production is that with only eight actors, portraying a plethora of roles was a necessity. While Cyrano de Bergerac was the lone character in his track, you’d think that filling up the track for the actors playing Christian and Roxanne would be overwhelming for the audience, yet it felt natural. This was truly the definition of an ensemble effort. The amount of trust on the stage was undeniable. But this is a play about a love triangle. And the trio that portrayed the lovers were superb. This production saw a dazzling performance from Gabriel Barre as the titular character. Somehow, someway taking on the biggest roles of the production, in character and direction, Barre was able to do it without faltering. The delicacies in Barre’s Cyrano allowed just the simplest of body language to tell a story. Cyrano is known for his nose. Yet Barre managed to make it melt away, never calling attention to it. This allowed his character to feel human, despite the insecurities Cyrano feels. Bridget Saracino was a beautiful Roxanne. Saracino looked like a glowing princess, excited about the prospect of discovering the splendor of love. There may have been a great separation in age between the characters but it never felt unnatural. Since Saracino had to tackle a few intimidate parts, she tapped into a tomboy side that helped separate her worlds. As Christian, Luke Darnell was a wonderful leading man. Darnell made Christian slightly dim but completely adorable. The remainder of the ensemble, made up of Rin Allen, Joe Jung, Mark Peters, Alexander Sovronsky, and Louis Tucci kept the piece active and jovial, seamlessly transforming in their ensemble roles. The space that Barre had to work with was ginormous. But Barre and scenic designer Ashley Cusack made great use of space. With a giant pallet as the stage, chairs, curtains, and ladders as the only elements, the storytelling was strong. There’s something about using your imagination for this story that works. Maybe it’s because we’ve all imagined our own romance. The lighting design by Pamela Kupper was picturesque. Kupper was able to capture an assortment of looks that separated place and time well. Cyrano de Bergerac is a play most people know. And like Shakespeare nowadays, there needs to be something unique about the production. Resonance Ensemble succeeded in telling a fresh version of Cyrano de Bergerac without reinventing the wheel. If only they could have gotten it down to singular act in only a hundred minutes.